Shop online for 139 blms model trains at discounts up to 46%. Roadway is the most popular of the 10 blms model trains categories, then Freight Cars, and Scratch Supplies. A perfect way to detail parking lots, this car stop is molded in a light gray color that can be painted for additional uses such as 5-Minute Parking and more. Sporting events, construction sites, fairgrounds and other places where there's no permanent plumbing are ideal spots to set this detailed model. Keep Cars & Trucks from Going Too Far! A perfect way to detail parking lots. Train crew's see interesting characters on a daily basis - why shouldn't your model railroad?. 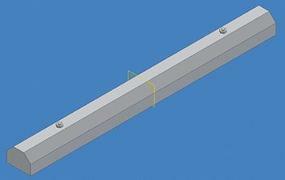 K-rails are portable concrete dividers that are used by railroads, government agencies, private companies, and more. In use or in storage, these barriers will add depth to your layout in a matter of seconds! This is the N Scale 60' Beer Car BNSF #780793 from BLMA Models. This is the N Scale ACF 70 Ton Gondola Sacramento Northern #4525 by BLMA. Roadside Billboard for Your Modern Layout Add modern outdoor advertising along your railroad. This billboard will look right at home on any post-1980s railroad. Featured on BLMA Modern Cantilever Signal Bridges and Modern Block Signals, these signal heads will fit a growing number of modern applications. Now you can add an ultra-realistic Thermo King Reefer Unit to your trailers! The prototype for this product is located at the UP (ex-SP) J Yard in Los Angeles, but its typical of modern corrugated-metal structures used across the continent since the 70s. This is the N Scale 60' Beer Car BNSF #780802 from BLMA Models. This is the N Scale 60' Beer Car BNSF #780810 from BLMA Models. 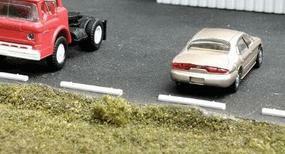 This is the N Scale People Mooning (4) (Plastic) from BLMA. Like our Modern Cantilever Signal Bridge, this all-new block signal features two operating signal heads (a total of 6 separate, micro LED's! ), super-fine detail, etched-metal components and 100% scale fidelity; this model is an asset to any modern HO Scale railroad! Designed to fit on any straight track section with Code 60 or larger rail, the product replicates a sectional rubber crossing complete with realistic treads and manufacturer markings. Trackside Signal Electronics Boxes are used to house the circuitry required to run grade crossings, trackside block signals, and more. These portable barriers are a common sight around government buildings, private security companies, rail yards, construction sites and more. Layout-Ready Sheds for HO & N Scales Trackside Equipment Sheds are great additions to your right-of-way scenes. 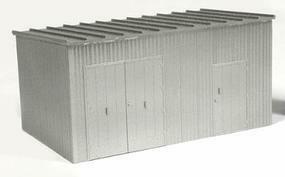 Whether used as speeder sheds, tool houses, electrical cabinets or material storage, these corrugated-metal sheds are ideal for use in diesel-era scenes.